I have made an error. I have started to try to apply logic to fairy tales, and now I have a few questions. Not least, why did I not think there was anything odd about these stories as a child? 2. In any case, why didn’t the glass slipper vanish at midnight like everything else the fairy godmother magicked up? 3. If the wicked step mother wanted proof that Snow White had been killed, why didn’t she ask for her head, not her heart? A head is a much more identifying feature. If only she’d asked for the head, she would have instantly suspected the huntsman had, in fact, killed a deer. 4. Why does identifying a pea under fifty mattresses prove someone is a princess? Moreover, if that ‘skill’ is indeed evidence of being a real princess, why did no one think to stick a pea under all those women claiming to be Anastasia Nikolaevna? 6. Hansel and Gretel overheard their parents discussing leaving them in the woods, so Hansel devised a cunning plan to allow them…to return to their parents. The ones who had worked really hard to lose them. How did they think that was going to work out? 7. Furthermore, why, when Hansel’s first plan led to the predictable outcome of them being abandoned in the woods again, did Hansel proceed to come up with the same plan, but stupider? 8. Most importantly, their father apparently loved the children and did not want to go along with the stepmother’s plan (twice, he went along with it twice). The stepmother’s plan, you may recall, was formulated due to the fact that they could not afford to feed all of the family. No one, least of all Hansel and Gretel, ever appears to have questioned why, given the key facts that he couldn’t afford to feed all of the family, he loved his children, and his wife was a callous old bat, the father didn’t dump the wife instead of the kids. That would also have reduced the mouths to feed. 9. Having put everyone to sleep, the good fairy summons a forest of thorns and brambles to shield the castle and prevent anyone from disturbing the princess. What? Why would she do that? Someone was meant to disturb the princess. The whole point of the counter-curse to make her sleep instead of die was so that the prince could disturb her: why are we making this difficult? Anyone? 10. Apparently, following the final night of gold spinning, the girl was married to the king the next day and a year later gave birth to a baby, but had forgotten her promise to Rumpelstiltskin. Of course. A year is a long time. Who hasn’t forgotten when their idiot mother/father (depends on the version) offered them to a sadistic king to perform the impossible task of spinning straw into gold, a task which was actually achieved by a small, magical man for the bargain price of their first born child. Could easily slip your mind. Nine months of pregnancy, no little niggle in the back of her mind: ‘Something about babies…my baby…giving someone my baby? No, it’s no use – it’s gone.’ Completely plausible. 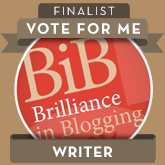 I am very excited to have been shortlisted in the ‘Writer’ category in the BiB Awards. If you’ve heard of my blog, like my blog, don’t want to vote for someone else in my category, aren’t sick of people asking, and have a minute to spare, I would love your vote! You can vote here. In this week’s edition of the Ten Funniest Things feature, we will be unimpressed by firework show offs, unconvinced by the shopping basket’s attempts to be a baseball kit, and wondering what on earth The Baby thinks is happening. The Toddler is doing some colouring. She requires Silly Mummy’s help: ‘Can you draw my trumps?’ A quick investigation reveals that there is a trumpet on The Toddler’s picture that she would like Silly Mummy to colour in. This is a relief, as Silly Mummy was not feeling equal to the task of trying to draw The Toddler’s trumps. Apparently, The Toddler has forgotten. She replies, ‘I don’t know. Let me see.’ Whilst stroking her face in her best Bond villain impersonation. The Toddler pants, ‘I don’t know!’ Well, of course not. Why would she?